Between its history, artstyle, and title, Brut@l is a unique game. With these features, it’s certainly a head-turner, but initial impressions can only get a game so far. As a rogue-like (in a time where gamers are flooded with rogue-likes), it needs to impress mechanically. It has to be addicting, egging the player to play one more level, or give the game one more try. It has to straddle the line between severe challenge and frustration. And if it has co-op, it better execute well, so the players are really striving together against the game. But sadly, I found Brut@l to lack these elements, despite my desire to really like this game. Let’s go back to the beginning and flesh out what I meant by “history” and “artstyle.” Brut@l is based on an ASCII dungeon crawler, which is a pretty far stretch from modern 3D video games. Some of you may be familiar with ASCII from the Atari and ZX Spectrum days of gaming. Others may have a history with it surrounding 90’s chatrooms and fancified game walkthroughs. For all you kids out there, ASCII is the ancient and revered artform of creating pictures out of common typed characters (such as periods, commas, pound signs, etc.). 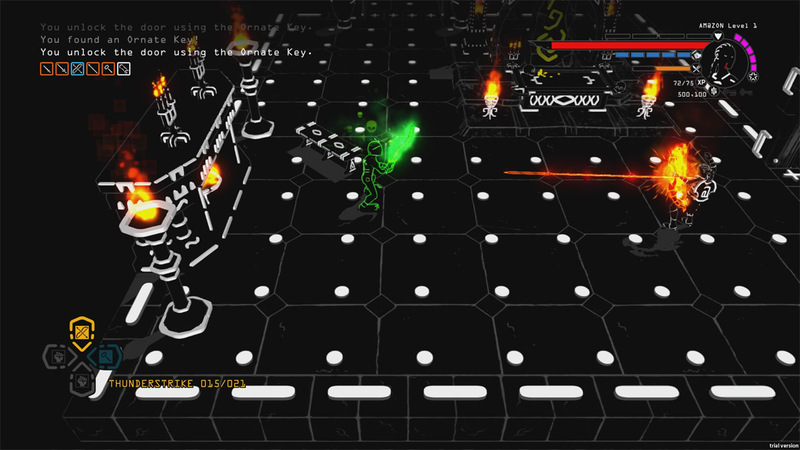 Brut@l fully embraces those roots, right down to the primarily white on black aesthetic and typed characters being incorporated within the maps and character designs of the game. All this, while still being a full 3D dungeon crawler experience. Continuing the tradition of those old school dungeon crawlers, the game is a rogue-like with both single-player and 2-player local co-op options. These two experiences are largely the same, so most of what I’ll talk about concerning the co-op will apply in single-player as well. 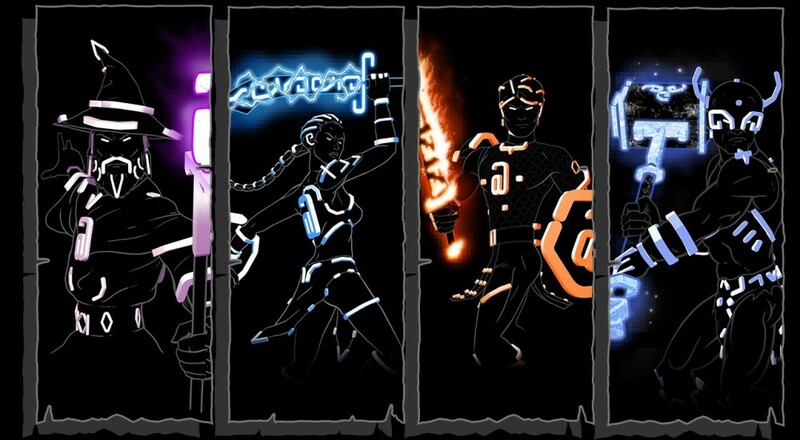 Upon starting a new dungeon and selecting characters (from 4 possibilities: Amazon, Warrior, Wizard, and Ranger), players are dropped into a procedurally-generated dungeon. The map is revealed slowly and looks like a classic ASCII dungeon when zoomed out (a nice touch). Players explore rooms, fight enemies, and pick up potion ingredients, weapon recipes, and food. When players get enough XP, they level up, allowing them to select a new skill. These are primarily passive (e.g. larger inventory space, more health), but there are some that are active (e.g. a huge jump attack which costs mana). Players also collect letters (of both the regular and enchanted variety) that allow them to craft and enchant weapons. Then, when they find the floor exit, they delve down into the next floor. It all keeps going until the players run out of lives, with the main goal being how far players can make it this time.